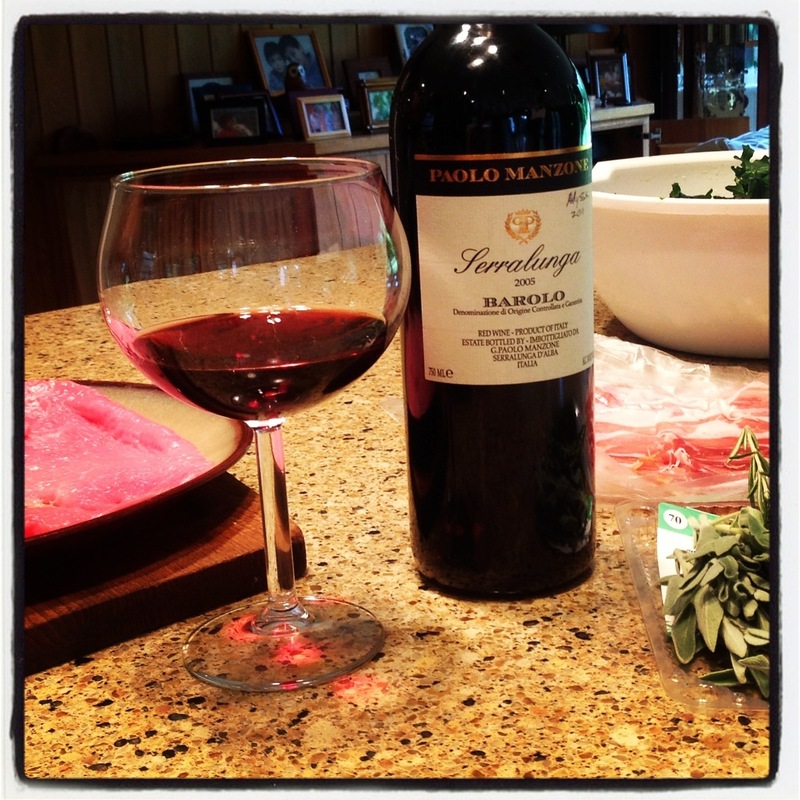 A little Barolo as we prep the veal saltimbocca! I don’t usually drink Italian reds but Barolo (made from the Nebbiolo grape) is good. Also, very expensive. For my own palate I’d usually buy another red for the price but people do go crazy over them. Medium body for a red, tart cherry, and great with food. Something kind of mysterious about them – “nebbiolo” means fog in Italian, and I think it’s a good word for the complexity of them. Also, I recommend whacking the crap out of veal. It’s pretty fun. Tags: barolo, Nebbiolo, wine. Bookmark the permalink. Oh Barolos, not for the faint of heart 🙂 I haven’t warmed up to them yet, but I must admit they are quite unique! I think they’re a lot more palatable than Brunello’s (Sangiovese). Not my fave in the world but very good. Well, there’s a reason if people go crazy for a good Barolo! 🙂 Nebbiolo is one of the great varieties in the red wine world, but it is also a finicky one, that only delivers great results in very specific terroirs. Plus, they are wines with strong tannins, meant for significant aging so they can keep evolving and their tannins get supple and well integrated. Pick wisely and you won’t be disappointed! Of you like Nebbiolo , you have to try out this winery , “poderi di luigi einaudi” , a DOC Nebbiolo of 2010 , 13,5% alcohol content . 2 years and half but really good , fine and elegant , the tannin was quite smooth and round . 20 € . We have eaten 6 different types of meat . Only the buffalo’s one was too strong for it . Even the winemaker was surprised about this wine . If you wanna discover really an high potential aging wines , I can suggest you the ” Prodigo winery ” , from Argentina but leaded by an Italian winemaker : I have tasted Malbec , Tempranillo ,merlot from 2001 to 2004 , and the tannin was still aggressive , rude , even after 10 years ! The producer told me that , since he is using just 100% varietal grapes and Italian experience , these wines ( Malbec above all ) are ready to be drunk after 20 years of aging and later. Unbelievable .